FORT MILL, S.C. – Sept. 16, 2015 – The Detroit™ DD13® engine is now available as a factory-installed option for select Western Star 4900 car haulers. The engine – which will reduce front axle weight and enhance fuel economy – can be spec’d for 40-inch, 54-inch, and 68-inch Ultra Low roof sleepers. The DD13 engine has a maximum rating of 470 hp/1650 lb-ft of torque. It’s designed specifically for vocational applications and delivers easy serviceability, performance and up to 5 percent better fuel economy. 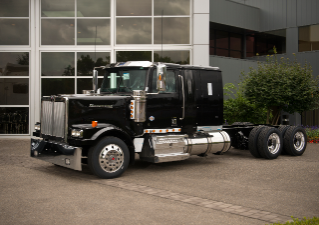 The new configuration will be available with the Eaton UltraShift® PLUS transmission, a tough and efficient option that will complement the powerful performance of the 4900. Additional features, such as an understep-mounted ATS with a horizontal tailpipe, and 200-gallon fuel and 30-gallon hydraulic tank setups, will further contribute to the car hauler’s improved fuel efficiency. The 4900 car hauler features extra-low front and rear suspensions, a low cab-to-ground height, and maximized head room in the cab to enhance driver comfort. 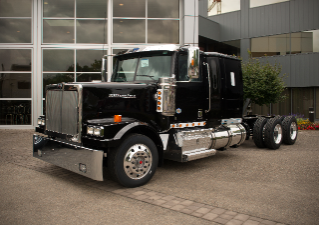 Production on the 4900 auto hauler with the DD13 engine is scheduled to begin in November 2015.